At its core, the mission of Appel Farm is to provide transformative arts and learning experiences as the arts education leader in South Jersey. Our programs on our campus at Appel Farm, in the schools, and in the community are raising the bar of arts education for our children and families in our community. Change the energy of Monday afternoons! Arts Lab immerses students, grades K – 6, in after-school arts enrichment for 10 weekly classes in the Spring and Fall. Arts Lab helps kids develop their artistic skills and to express themselves, it also offers a creative, enriching and affordable alternative to traditional school aftercare. Choose the Visual Arts Track or the Arts + Technology Track, and start looking forward to Monday afternoons! The joy of camp for the whole family! 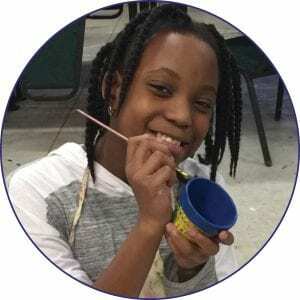 Family Arts Camp offers the joy of camp for the whole family! 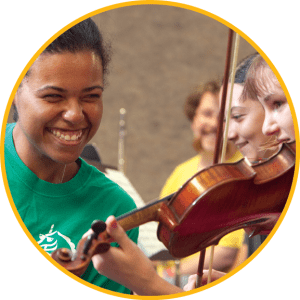 For more than 50 years, Appel Farm Arts Camp has transformed the lives of thousands of young people, helping children develop artistic talents, gain self-confidence, and make friendships that last a lifetime. Now we are offering our families a chance to experience the magic of Appel Farm summer…together. Girls Out Loud! 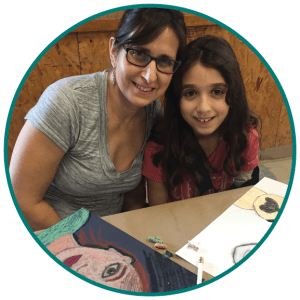 Our Mother Daughter Art Retreat is designed for Mothers, Grandmothers, Sisters, and Daughters of all ages! Laugh, listen, and create as you participate in movement, writing and visual arts workshops that explore the concept of dreams. Moms: hear about your daughter’s hopes and dreams for the future. Daughters: discover that mom is not only “mom” but a woman just like you, with her own dreams and aspirations. 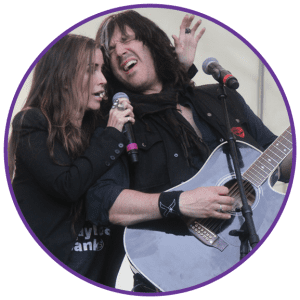 Come join us at Appel Farm Arts and Music Center for a weekend packed with intentional opportunities for connection. 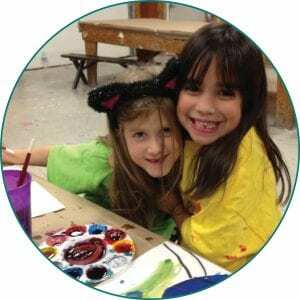 Journey Jamboree and Crafty Campout welcome Girl Scout Brownies, Juniors, and Cadettes for fun-filled weekends of creative activities that encourage critical thinking and skill building. Also open to all girls 2-8 grade and their chaperones, the girls spend the weekend earning Journeys and Badges designed specifically for Girl Scouts, and great for all the girls! We look forward to working with you to build girls of courage, confidence, and character, who make the world a better place! Shining a light on the creative students in South Jersey! We are thrilled to partner with schools to shine a light on their students as the Region 2 partner for New Jersey Poetry Out Loud, the affiliate for South Jersey South Art Region of the Scholastic Art & Writing Awards, and the host of the Salem & Gloucester County Teen Arts Festival. Each of these programs culminates in loads of arts and learning, adjudication, performances, award ceremonies, and a celebration of the creative students in South Jersey, all here at our campus! We view the arts as basic to education and our Arts in Schools programs are making this vision a reality. Appel Farm offers a wide range of art workshops, residencies, and field trips, through Creative Connections. We work with schools on unique and collaborative Curricular Partnerships to create transformative arts and learning experiences for their schools. Appel Farm also offers customized Professional Learning, working with teachers, teaching artists, and school administrators to craft the professional learning experiences that will meet their goals. Appel Farm is proud to be the southern regional partner for the Artists In Education Residency Grant Program, a co-sponsored program of the New Jersey State Council on the Arts that places highly qualified, practicing, professional artists in long-term residencies in schools. We also bring year-long artist residencies to five schools as part of Bridgeton Public Schools’ 21st Century Community Learning Centers Program. Appel Farm connects with partner organizations that provide social services and healthcare to a diverse range of people to reach children and families who otherwise may not have access to the arts. We believe that everyone has the ability to learn and to express themselves through the arts. The arts have amazing, transformative power for youth, adults, families, and communities regardless of abilities or prior experience. 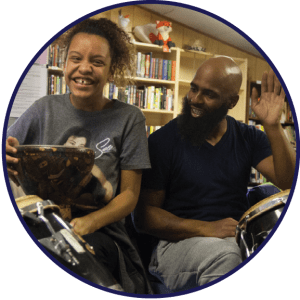 Our Arts in Community program demonstrates how participation in the visual and performing arts can enhance creative expression, improve wellness, strengthen family ties, promote positive change and empower individuals to become their best selves. Strengthening families. Building Futures. 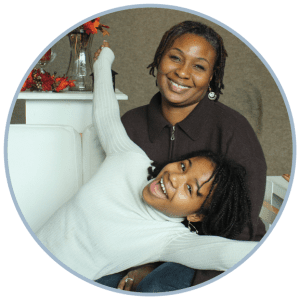 Families to College cultivates family bonds and improves academic and employment success in Cumberland County through a comprehensive whole-family mentoring program. Wellness through the arts. Appel Farm’s HeArt and Health programs have helped people at nursing homes, hospitals, veteran’s homes, daycare facilities for special needs adults, community centers, psychiatric facilities, churches, and transitional housing sites. Helping kids be their best selves! Creativity CoLaboratory Charter School, opening in September 2019, the tuition-free choice for middle school students in the 5-8th grade, will provide personalized hands-on, creative and fun learning that helps prepare youth with 21st-century skills. The Creativity CoLaboratory will offer a STEAM Curriculum that puts arts in the mix: Science, Technology, Engineering, Arts & Math. The arts teach communication and expression. Arts integration at school makes learning even more accessible, fun and effective for every type of kid.